+ATK: The overall safest choice of Asset for Alm. With the refined Falchion granting him an automatic follow-up when active, Alm will greatly enjoy the Attack boost for even greater damage output no matter the build. +SPD: Alm’s Speed stat of 30 is sitting in an awkward position where he can struggle to perform follow-up attacks while also struggling to avoid them. However, for offensive purposes, Alm is actually capable of boosting his Speed quite substantially in case one wants to run a quad build. If this is what one wants to do, A Speed Asset will prove to be valuable. HP: Alm has really good HP. This helps him to perform well in a support healer role and to make effective use of Panic Ploy. HP can be a decent Asset if a healer support build is what one wants to do with Alm, but is otherwise inferior to an Attack or Speed Asset. DEF: Alm's Defense is best left at neutral since the majority of units who will be capable of counter-attacking him will be physical attackers. Not useful enough to recommend as an Asset, but useful enough to not want to be reduced. Can work as a Flaw if there’s no other option. -RES: Overall Alm’s optimal flaw. His Resistance is poor to begin with and is the overall least beneficial of all his stats so ditching it for other stats will serve Alm well. With his refined Falchion, Alm can sweep his way through the battlefield as a strong offensive sword unit. The refined Falchion is the star of the show, granting him a brave effect when at full HP as well as Renewal and effective damage against dragons. You’ll ideally want an Attack asset with a Resistance flaw to go along with this for the most damage possible. The assist slot is open to personal preference; Reposition works well for a nice safe choice but anything can work. Moonbow and Glimmer both make for great specials as their low cooldown allows Alm to proc them consistently, potentially even every round of combat with Heavy Blade. His default Draconic Aura is also a nice budget option. Death Blow in the A slot gives Alm a great boost of damage when combined with his Falchion. While Death Blow 4 will provide more power than Death Blow 3, it is not completely necessary for this build and Death Blow 3 will prove to be a solid budget option. One could also use Swift Sparrow for a slightly lesser boost to Attack in exchange for more Speed which in turn aids Alm in activating Windsweep if it’s being used. His default Attack +3 works well enough for a budget option. Mystic Boost will prove to be an invaluable B slot for Alm, healing him after every round of combat and thus helping him to keep utilizing his refined Falchion. Chill Def is another strong option, helping Alm to deal even more damage against anyone affected. As a budget option, his default Windsweep prevents the follow-up of anyone he attacks and is faster than, meaning he can safely attack and damage bulkier units who he may be unable to KO. Renewal will stack with his Falchion, giving him 20 HP every other turn, allowing him to take a bit more damage and still potentially heal up to reactivate Falchion. Quick Riposte is another good option to allow him to also function well for baiting on enemy phase. Threaten Def in the C slot will debuff the Defense of anyone within 2 spaces, giving Alm even more damage potential. Still, the C slot is very flexible and anything can really work. Heavy Blade and Phantom Spd both make for ideal seals of choice. Heavy Blade works great with Moonbow and Glimmer as the increased cooldown charge means he can activate either Special every battle if he can activate Heavy Blade. Phantom Spd also works well to greatly increase Alm’s chance to activate Windsweep. A simple Attack +3 Seal also serves as a viable option to increase his damage output. With a good HP pool, Alm can function well in a pseudo-healer set, making for a great support unit while also remaining effective in combat. The key to this build is his assist skill combined with Falchion and Renewal, as well as his large HP pool. With Refined Falchion, Alm reaches a plentiful 48 HP, enough to fully heal most non-armored allies. If one has allies of a higher HP stat, Alm could opt to take an HP Asset or an HP +5 Sacred Seal, but doing so will prevent Alm from taking an Asset or Sacred Seal that will benefit his combat. Refined Falchion and Renewal allow Alm to regain 20 HP every other turn, giving Alm great sustainability and he can then utilize either Reciprocal Aid or Ardent Sacrifice to pass on this constant HP flow to another unit. Alm’s IVs, Special, and A slot skill should be utilized to increase his combat potential. An Attack Asset will prove the safest choice overall to increase his damage output. His default Draconic Aura will make for a nice Special and works well thanks to his good Attack. Sol or even Aether could also be run for even more healing potential. Death Blow makes for a great A slot choice that greatly increases Alm’s damage output when attacking. While Death Blow 4 is objectively stronger than Death Blow 3, it is completely unnecessary if one does not wish to invest that highly and Death Blow 3 will work perfectly fine. If on the strictest of budgets, Alm does come default with Attack +3 which will give him an Attack boost for zero investment. Thanks to his high HP, Alm can make effective use of both Panic Ploy and Infantry Pulse. Panic Ploy allows Alm to place the Panic status on foes and turn their fields buffs into debuffs while Infantry Pulse allows Alm to support his infantry allies with free Special charge on turn one. Outside of Panic Ploy and Infantry Pulse, almost anything makes for a good C slot. Skills such as Drives and Spurs are safe choices. Finally, Alm can utilize his Sacred Seal slot to give him extra support capabilities with a Drive or Spur passive. He could also opt for a simple Attack +3 Seal for extra damage. If it’s not being used in the C slot, he can also utilize Panic Ploy in the Sacred Seal slot. Alm is not exactly known for his Speed, but with enough skills and buffs, Alm can actually become extremely fast and is capable of performing four attacks in a single round of combat. This set is reliant on two main factors: Alm’s weapon and him having a lot of Speed. If he can both naturally perform a follow-up and have his Falchion active, he will perform four attacks when initiating combat. Of course, his refined Falchion is mandatory, granting him a Brave effect when at full HP. He will be injured after combat for one HP, but the in-built Renewal helps offset this, plus his B slot can be utilized to help with healing as well if desired. The most important thing is to ensure Alm gets a lot of Speed. As such, a Speed Asset is highly recommended. The A slot and Sacred Seal should also be ideally used to bolster Alm’s Speed. Atk/Spd Solo is the best option for this, providing Alm with a huge offensive boost whenever he has no nearby allies. This is very expensive, however. Swift Sparrow is another solid choice, providing less of an offensive boost but also being much cheaper and only requiring Alm to initiate combat. On a budget, Darting Blow can work to give a large Speed boost when initiating combat, though with no extra Attack. Darting Blow is also recommended in the Sacred Seal slot. Should someone else be using the Darting Blow Sacred Seal, Alm could instead opt for a simple Speed +3 Seal. With all these things alone, Alm is capable of reaching 45 Speed (with Atk/Spd Solo or Darting Blow) or 43 Speed (With Swift Sparrow). With merges and/or buffs, his Speed can be pushed even further. Chill Spd makes for an excellent choice of B slot. Alm will gain increased follow-up potential against anyone affected, not to mention this will also improve everyone else’s performance against the affected. Alternatively, Mystic Boost will heal Alm after every round of combat, helping him to stay at full HP so he can keep using his Falchion. Renewal is a cheap and effective option that will heal him every other turn, also helping to keep him at full HP. The remainder of the kit is mostly personal preference. For Assist, Reposition will be a safe choice, though one’s preferred movement Assist can be used instead. There are various Specials that work. Luna and Moonbow both work great to boost Alm’s damage output, Sol could be used if one is concerned with keeping Alm healthy, and Draconic Aura is a nice choice due to Alm coming with it by default. The C slot is open to one’s own preference. A Wave skill such as Even Spd Wave makes a great choice that helps Alm to secure follow-ups, but if he can be provided with Speed buffs from teammates, this will be unnecessary. Skills like Drives and Spurs make for safe C slot choices if one is not sure what to use. Alm comes through as another wielder of the divine blade Falchion, making him the fourth unit in the game to possess this weapon. His balanced stat line makes him appear to be the least desirable of the Falchion users, but this is absolutely not the case. Thanks to his refined Falchion, Alm went from being the least desirable Falchion user to arguably the best of the bunch. With 45 HP, 33 Attack, 30 Speed, 28 Defense, and 22 Resistance, Alm suffers from balanced stat syndrome. He has decent to good stats in all areas, but nothing that stands out. His most notable aspects are his plentiful HP stat of 45 and his fairly good attack stat of 33, allowing him to soak some damage with his HP and deal some good damage with his Attack. 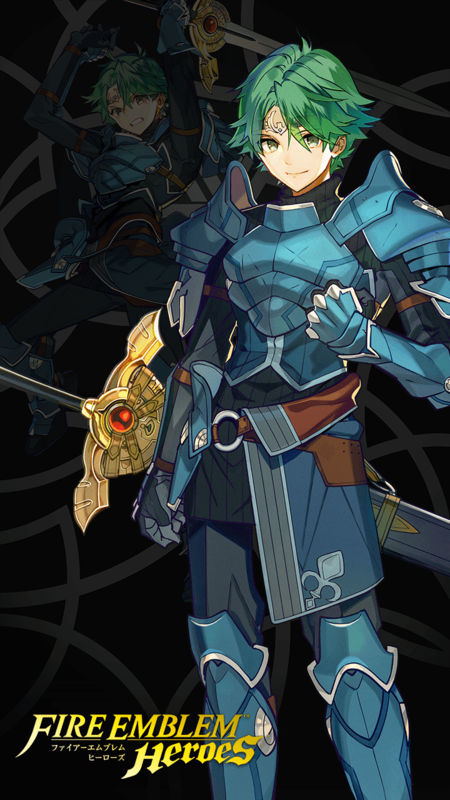 His Falchion is what truly allows Alm to shine. Alm’s refined Falchion gives him Renewal 3 as opposed to Renewal 2 but most importantly, he gains a Brave effect whenever he’s at 100% HP, meaning he’ll make a second attack immediately after his first. This effectively gives Alm a 16 might Brave weapon with no speed penalty when he’s at full HP. This does come at the cost of 5 HP of non-lethal damage after using the effect, but this is only a small problem given Falchion has Renewal 3 built in as well. Of course, on top of all this, his Falchion still deals effective damage to dragon units. Alm’s power skyrocketed thanks to the Weapon Refinery. His amazing Falchion finally gives him his own niche among the Falchion users. He still suffers from his balanced stat line but his weapon makes up for it by a considerable amount. Overall, Alm is definitely a combatant worthy of your consideration. Trust in Falchion and you will find one hell of a sword fighter in Alm. Alm’s Refined Falchion is nothing short of amazing. The unrefined Falchion is nothing special, granting Renewal 2 and effectiveness against dragons. Alm’s refined Falchion, however, grants Renewal 3, the same effectiveness against dragons, and the ability to attack twice in quick succession when attacking and at 100%, though at the cost of 5 HP when the effect is activated. However, Falchion’s built-in Renewal 3 helps to offset this HP issue and restore Alm to full so he can utilize the effect again. While not the highest, 33 attack is fairly good overall. This is the same attack stat as Ayra. Alm can put this good attack stat to very good use thanks to his refined Falchion granting him a brave effect. Alm has good physical bulk and a plentiful HP pool at 45 HP and 28 Defense. While not bulk on the level of Chrom, his higher speed makes him better at avoiding double attacks. He can also benefit well from the refined Falchion’s built-in Renewal 3 which grants him some good self-sustainability. At 22, Alm has quite poor Resistance. He will fall very easily to blue mages such as Reinhardt and Ophelia while also struggling with resisting red mages such as Celica and Lilina. While he fares better against green mages such as Nino thanks to the weapon triangle advantage, green mages can still dent him quite badly, if not still KO him. Alm’s balanced stat line does him a disservice. With good HP, good Attack, average Speed, average Defense, and low Resistance, it’s hard to call Alm anything more than average when based on stats alone. Luckily though, his refined Falchion helps to alleviate this issue quite considerably. If one is using Alm as an offensive unit, he will appreciate protection from strong blues and units which can support him offensively. He’ll also appreciate all the support he can get through buffs or healing. Strong Greens: There are plentiful options for strong green units out there that can help Alm against blue foes. Surtr, Brave Ephraim, Cherche, Raven, Helbindi, Fallen Robin, and Myrrh are just a small handful of melee green fighters that are all very strong. There are plenty of strong ranged green units too, such as Nino, Lewyn, and Sonya. Buffers: Buffers such as Ephraim, Linde, and Delthea can all support Alm extremely well; all three of the aforementioned options can also aid Alm in combating tanky red units that he can sometimes struggle with. Refreshers: Being able to grant Alm with an extra action, practically any refresher will make for a great ally to him. Of worthy note are the flyer dancers, especially Legendary Azura which can grant him with both an extra point of movement and with a full range of buffs thanks to Prayer Wheel. Healers: The simple fact remains: Even with all the self-healing in the world, it’s still possible for Alm to become severely injured which in turn would make it take several turns for him to get back to full. This is where a healer will come in handy to ensure Alm can stay healthy. A powerful offensive healer such as Brave Veronica, Maribelle, or New Year Laevatein is recommended. Alm’s biggest weakness is blue units of any kind, namely bulky blues and blue mages. Blue dragons are not a massive issue with his Refined Falchion, but they can still be threatening if they attack Alm first. He can also suffer from strong sword units if they can get the attack on him. Tanky Blues: These types of units possess great defensive potential and Weapon Triangle advantage over Alm, making it best to avoid attacking these types of units with Alm or allowing them to attack him; some notable examples are Brave Hector, Winter Ephraim, Hardin, and Ephraim. Blue Mages: Blue mages such as Reinhardt, Ophelia, Ishtar, Linde, and Delthea will have no problem at all with Alm thanks to their weapon triangle advantage and his low resistance. Red Mages: Without the protection of the Weapon Triangle, many red mages will be able to easily deal with Alm. Celica, Lilina, SM Eirika, Summer Tana, and Bridal Tharja are examples of red mages that can easily KO Alm. Alm double lion makes him get guaranteed doubles when at full hp since he takes 5 damage hp atk/spd push gives him plus 5 Atk/spd when attacking when he's at 100% hp this stacks with double lion and after combat he gets dealt 1 damage, so after all the damage is taken after attacking mystic boost activates after combat healing 6 hp since double lions does 5 after and atk/spd push deals 1 do your math its 6, mystic boost beings it back to full hp ready to attack twice again heavy blade is there to make ignis activate faster one round of combat or it can be switched out for moonbow for armours. The bane, can be -SPD, -DEF or -RES. This build has SUMMONER SUPPORT. Since his Falchion refine is Double Lion, he attacks twice and gets 5 damage after it, it also gaves him 3 HP. Why the Galeforce? It's simple. After attacking x2 or x4, he will activate or at least, will be close to activate it. His A skill depends, you can use Death Blow 4, but I'm using Sturdy Impact, it helps him if he initiates combat and get +6 Attack and +10 Defense, also foe cannot make a follow-up attack with this. B skill, since he lose 5 HP with the Double Lion, Mystic Boost helps him gaining 6 HP, which is awesome for his Galeforce if he activates it. The only goal for Mystic Boost here is in the case of the Galeforce being activated, we can put aside the other effects of Mystic Boost. Infantry Pulse, or, Panic Ploy. Having such HP, will activate IP or PP easily. Since Heavy Blade's effect is "If unit's Atk > foe's Atk, grants Special cooldown charge +1 per unit's attack. (Only highest value applied. Does not stack.)" and Alm has a good ATK being +ATK, it will helps him activating the Galeforce quickly. Alm will attack twice and have +5 Atk/Spd as long as his HP is full. After combat he will take -6 damage if he attacked. Mythic boost 3 will heal the 6 damage and put him back in beast mode. Glimmer is a good special for consistent damage but can be switched out. Even def wave because it is not hard to get but you can switch it out for anything that increases his defense or speed. I didn't think Alm warranted a really good sacred seal like Close Def 3 or Atk/Def Bond but if he is your husbando you'll want to give him one of those depending on if you want to go with more attack or more defense. Mystic Boost 3 counters the recoil damage from double lion, allowing Alm to permanently have double lion ready in any combat. Aside from the healing it provides, it also negates effects of Wrathful staff, allowing Alm to take reduce damage when a staff unit engages combat.